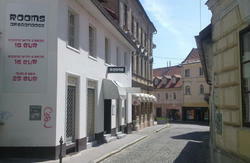 We are a small&cozy familly run hostel just a 5 minute walk away from the main (Preseren) square. Newly renovated building with 2 private rooms (that both have small private balconies) and three dorms(4 and 2x6 bed). Common balcony is also available, as well as a comfortable common room. Wi-fi throughout the hostel. There are no stairs to climb! 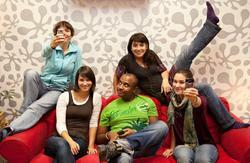 Our staff is very friendly and we will be happy to offer you help and information. All our visitors get keys and will have no worries about personal belongings. All sightseeing can be done with ease on foot. Bars and restaurants are in walking distance. Noise from the street is minimal since most of bars are a few minutes away and not directly around us. Reception works 10am-10pm. You can always call us if you arrive late. The number will be right in front of the entrance. We assure you, that we will always let you in no matter the time you arrive:) We will be pleased if you notify us about late arrivals, of course. All we ask is people to respect quiet hours after 10 pm. Pets are forbidden. Smoking is forbidden. Airport Ljubljana: The Joze Pucnik airport is around 20 km from the city of Ljubljana. In case you have a wish for us to pick you up by car, please inform us 2 days in advance. We charge 10 euros (for up to 3 people). By car/motorcycle: There is a motorway ring all around Ljubljana. We advice you to take the first exit once you see Ljubljana (east, west, north or south) because we are a similar distance from all exits. If you will follow signs for center you will reach Ljubljana center in around 10 minutes. Once you have reached the city center (Bus/Train station, Dragon bridge, Castle or any other sight) it is the best to give us a call and we will come pick you up personally in case you will not be able to find us. There is no parking available because of the pedestrian zones around, but we will assist you in finding a proper place depending on the length of your stay.